March. Time for my annual spring panic attack. The weather starts getting nicer, and my children (and I) start losing motivation to keep on keeping on with the daily lesson plans. At some point I look to see just how much is left to accomplish, and I begin to worry over those math/history/science/grammar lessons (take your pick) that we planned to start right after Christmas but haven’t yet begun. Or I see that one or more of the kids have finished only eight of twenty scheduled chapters in a course, and I quickly feel overwhelmed and totally inadequate. It’s in these moments I start second-guessing God’s very call to homeschool my children. Am I holding up my end of the bargain? How can I be sure that my children are learning everything they need to know to be successful in life? Just who do I think I am to tackle this kind of responsibility? I know I’m not alone in feeling this way. Many homeschooling moms have told me of times when their thoughts spiraled into a terrible tailspin and they wondered, What am I even doing? Then one day, in the midst of my own tailspin, God led me to consider chapter six of the book of John. In this passage, 5,000 people are following Jesus to a mountainside because of the miracles He’s performed. When Jesus looks up and sees the crowd coming toward Him, He asks His disciple Philip, “Where shall we buy bread for these people to eat?” Philip answers pretty much like I probably would: “We don’t have the money to feed all these people! Why, eight months’ wages wouldn’t buy enough bread for each one to have a bite!” Then another disciple, Andrew, speaks up. He’s not sure how it can help, but he points to a boy carrying five small barley loaves and two small fish. Think about that young boy. He’s been called out from among the masses, and the only thing that sets him apart from the others is that he brought a picnic lunch. Who packed that lunch for him? Obviously—okay, it’s obvious to me—his mom packed this lunch before sending him out to listen to a Teacher who could explain things to him that she could not. What interests me is that this lunch really isn’t much. Barley was a poor man’s grain, and the loaves were probably about the size of biscuits or rolls. The two fishes, according to some Bible scholars, were probably like sardines. Clearly this was not an extravagant lunch, but a few loaves and fish were all this faithful mom could pack for her son. Oh, and she apparently taught him to share because we don’t read in Scripture that he makes any fuss or even protests when Andrew takes the boy to Jesus to donate his lunch! The highlight of this story occurs when Jesus takes the meager lunch, blesses it, multiplies it, and uses it to satisfy the multitude—and still has twelve baskets full of leftovers! What can we as homeschooling moms take away from this story? Well, I see two things. First, God’s math really is a wonderful thing. And second, we just need to pack our children’s lunch. It’s as simple as that! Yes, we moms need to continue to pour into our children those things that are important for their personal and spiritual growth—character qualities like sharing, academics like math and science—but most importantly, we need to encourage them to listen to Jesus and follow His teaching. If we’re faithful to pack their lunch using the gifts He has given us, meager though they may be, then we won’t need to stress about whether we have the most expensive curriculum, if we’ve covered all the material in every subject, or how much our home school looks (or doesn’t look) like someone else’s. We can rest in the knowledge that God will take the barley loaves and fish we lovingly pack in our children’s lunches and He will bless and multiply our insufficient gifts so that those who partake of it will have more than enough. 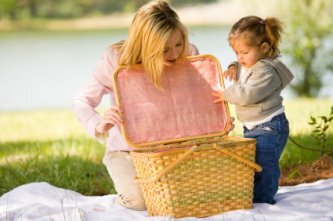 So when those springtime seeds of doubt and discouragement begin sprouting and twisting your thinking, just pack a picnic lunch and trust in God’s math!